I was really looking forward to trying Olive Tree Cafe which specializes in Greek food, but it was very crowded! Next time! 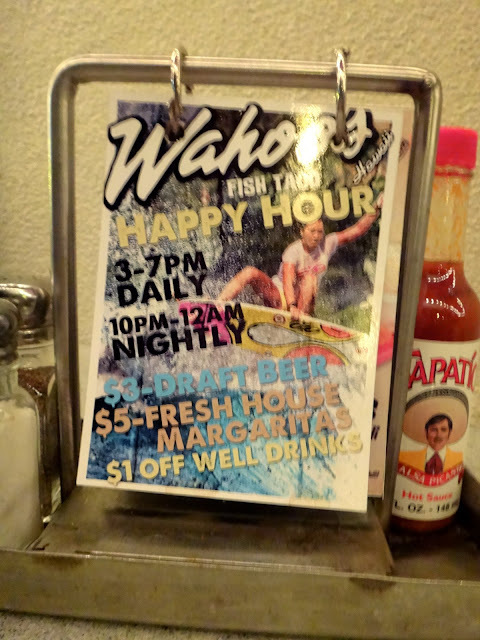 Although we had a change of venue, I was really happy with Taco Tuesdays at Wahoo's. We had a great time, full of margaritas and chicken/fish/beef tacos! If you're looking for a great place to hang out, eat some tacos, and drink, all while listening to live music, this is your place!! Check out Wahoo's Taco Tuesday Specials and other Taco Tuesdays venues on Oahu here! Loaded with spicy tomato salsa and lots of lettuce/cilantro. Love taco tuesdays. I wish there was a taco Friday, Saturday, Sunday...etc. Well, you get it. I can't wait for your review on Olive Tree.